Professional service for transfers, arrangements, tours and all kinds of events. Baby chairs and elevators without cost. Travel with all the tranquility and security. We offer final prices without surprises. Offers without competition to the main destinations. Autochofer del Mediterraneo S.L. born in 2004 with the union of several professionals from transport sector. Autochofer del Mediterraneo S.L. offers global passenger transport solutions, we have the ability to adapt to any demand from our customers with the guarantee of the best service. Autochofer del Mediterraneo S.L., offers global solutions for passenger transport by road, we have a large and modern fleet of latest generation vehicles. We put at your disposal a highly qualified human team with the necessary experience to make your journey safe, comfortable, fast and pleasant. Our services: rent with driver, transfer of airports, weddings, events, arrangements, excursions, etc. they are aimed at an increasingly demanding public that does not conform to a simple displacement. Enjoy our great experience in the sector, which allows us to guarantee a total safety and quality of our services. Currently, Autochofer del Mediterraneo S.L. is formed by two companies: ADM & ADM BUS, focusing its services on car rental with driver, passenger cars, minivans, minibuses and buses. 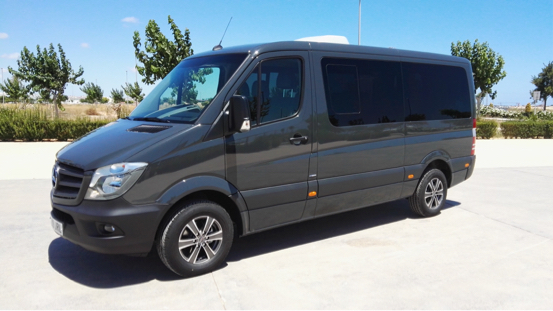 Over the years we have been forced to adapt to the needs of our customers, we have the necessary means to transport golf groups, cycling teams, VIP services, etc. We have a wide variety of services, comfortable luxury cars for any special occasion or any type of service, all with excellent personalized service. If you need to organize a congress or any event, we take care of everything, we provide the most exclusive vehicles and the necessary means for the transfer of speakers and guests. We offer quality services thinking only of our customers. Turn your transfers into moments of relaxation and comfort. We have the most competitive prices in the market without sacrificing our exclusive service. You can make adjustments and changes when you need them, thanks to our service 24 hours a day, 7 days a week. We put at your disposal our large fleet of luxury vehicles with driver, for your travels in Alicante and Murcia. Very easy to book. Driver waiting on time as stated with name on a board at arrivals. Very smart driver and clean car. On return journey driver arrived early identified himself and very quick transfer back to airport. Everything went dry smoothly on both journeys very happy and will use us again. Our Driver was on time and very pleasant. The car was clean and comfortable. Our quote was very competitive. Excellent service. Got back to me very quick with answers to the Questions I had, very good service and reliable. The driver arrived promptly and was very polite. The car was clean and perfect for our needs. The price was very competitive and we received a text message from the driver when he arrived at our pick up point. Driver was waiting right at arrival lounge. Mini bus was parked right at door. Service excellent from start to finish. Great transfer, was there on time for pick both at hotel and airport. Very friendly driver impeccable car would use again next time A* service. Driver waiting in arrivals so no waiting about. Picked us up for our return journey with no problems at all. Very professional driver. It was very easy and straight forward to book online. Very friendly greeting, straight to the taxi and off to my destination. I was a single female traveller and felt extremely safe and at ease. I would defiantly recommend to other travellers. Perfect transfer. Smooth and efficient. The driver was waiting for me. I recognized him right away as he was holding a card with my name on it. Clean car. Driver correct and efficient. Efficient and prompt. Even though our flight from London was delayed and we arrived much later then expected, the driver greeted us as expected and quickly got us to our hotel. Same on the return driver was on time. Clean and efficient service. Would recommend to anyone needing a taxi service from San Javier airport. Excellent service. The taxi was waiting for us at the time requested for both journeys. The vehicles were clean and the drivers courteous. Would definitely use again. We work with the most important clients and brands in the sector.